A relentlessly paced thriller in which a man has to turn detective to protect his little girl and determine the truth behind his wife’s death. When Glen Garber’s wife, Sheila, is killed in a drunk driving accident, he’s shocked and disbelieving when he learns that she was the drunk driver. Suddenly a single father, he struggles to reconcile Sheila’s final act with what he knew of her, but things just keep getting stranger. One of Sheila’s best friends is killed in another bizarre accident right after yelling at Glen’s eight-year-old daughter, Kelly, for overhearing a phone call. The intrigue mounts. Glen receives threats and inexplicable instructions from Sheila’s friends; someone shoots out Kelly’s window; and a sinister figure with ties to organized crime pays a visit to the Garber household. Glen’s contracting business, already in financial trouble, may be on its way to becoming another victim. The background and setting are über-current, with small-town families struggling to survive a recession, tricky sub-prime mortgages and home foreclosures. Unsure of the local police department, Glen is forced to undertake his own investigations. Is someone trying to destroy his business? What questionable sideline dealing was Sheila involved in? And who or what, exactly, killed her? Glen, a competent builder but a decidedly amateur investigator, is most importantly a loving father. After all the dust settles, this heart-pounding thriller is surprising family-oriented. 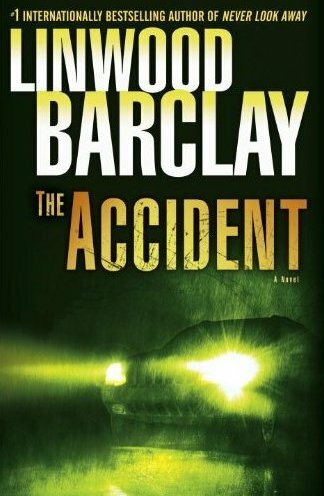 Barclay’s (Never Look Away) fast-paced, twisting plot keeps the reader guessing at who the good guys and the bad guys are. Allegiances shift. Glen isn’t sure who can be trusted; and while we stay a step ahead of him, the ending still comes with a shocking crash. This review originally ran in the August 9, 2011 issue of Shelf Awareness for Readers. To subscribe, click here, and you’ll receive two issues per week of book reviews and other bookish fun!